FAQ's - The Latest Innovation In Outdoor Laser Tag Equipment Take Advantage Of Our 14 Day Trial Program! Are your laser tag guns durable? Yes. Our guns are durable and we know this because our guns are used practically everyday for either a birthday party, corporate function, school function, fair, or carnival. People run, crawl and roll around on the ground with them. They've been dropped, been used in modest rainy weather (no terrential downpours), and have been used in the snow. Our oldest guns are still working even after five years with minimal maintenance! 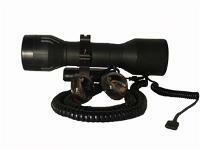 We even cover the laser tag units with a two year warranty and the airsoft gun with a one year warranty. Our guns are definitely durable, but don't misunderstand, they are not indestructable. Nothing made by man is. 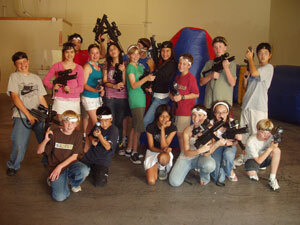 Why do your outdoor laser tag guns cost so much less than competitve commercial grade outdoor laser tag guns? First of all we understand that Return On Investment should take a relatively short period of time. So we designed the Ikon-x with this in mind. To keep the price relatively low we realized that we needed to shrink the electronics into a a small space. After six months of design we accomplished that. Then we designed a small space that could be versatile enough to be used with virtually any replica weapon. Also accomplished. While others use metal based encasings shaped to look like a gun (in our opinion they don't really look like the guns they're supposed to imitate) we use hard and durable plastic. Plastic not only keeps the cost low it also keeps the weight of the units down. Well, don't you get what you pay for? Sometimes yes and sometimes no. It depends on the product and the company behind the product. This is why we feel confident in giving our customers a 14 Day Trial Period to determine for themselves. We want you to be satisfied with your decision to purchase our laser tag guns. How long does the rechargeable battery keep its charge? 10 hours of continuous play during daylight hours when the LCD screen's backlight is off or 8 hours of continuous play during night hours when the LCD screen's backlight is on. How long does it take to charge a "dead" battery? About 1 hour. The charger indicates 4 stages of charge (red, orange, yellow, green). The battery will work at the orange stage, which takes about 20 minutes to reach. This will give you a few hours of play if needed in a quick emergency. How far does the Ikon-x shoot? 200+ feet in broad daylight and 350+ feet at night. 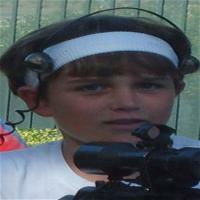 What's the best way to place the sensors on the headband? have determined that sensor placement on the left and right side of the head is optimal for best play. Do your laser tag guns come with a warranty? Yes. On any manufacturer defects. A two year warranty on the Ikon-x laser tag main unit and a one year warranty on the airsoft gun. We pay for shipping up to 90 days for any warranty issues. The customer pays for shipping after 90 days. Can I purchase just one gun or one device? One gun or one device is useless without another with which to interact. Therefore we will ONLY ship out one gun or one device to existing customers. If you are a new customer you must purchase at least two guns or two devices.